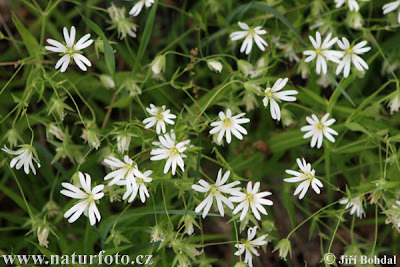 Flowers of Stellaria graminea, photographed by Jiří Bohdal. 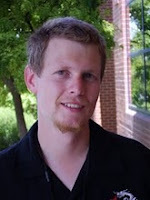 Last week, I described a situation where low morphological diversity disguised high chromosomal and species diversity. So it is fitting that, this week, I should be focusing on an almost opposite situation: high morphological and chromosomal diversity, but low species diversity. Stellaria is a genus of weedy herbaceous plants native primarily to Northern Hemisphere temperate regions, though some species have been spread around the world by humans. Members of the genus are mostly characterised by deeply divided petals, so that at a glance a Stellaria flower may look to have twice as many petals as it really does. (It is notable in this regard, however, that Chinnappa & Morton (1984) recorded raising a single seedling of Stellaria longipes during breeding tests that produced flowers with entire rather than divided petals, a feature generally characteristic of other related genera.) Up to about 200 species have been assigned to the genus (Bittrich 1993) but, considering what has been established with the American S. longipes complex (read on), I would not be at all surprised if that number is somewhat inflated. A review of Chinese Stellaria by Wu (1991), for instance, reduced a third of the species treated to synonyms. Stellaria longipes, photographed by Michael Shepard. The issue, as already alluded, is that some of the widespread Stellaria species are extremely variable. 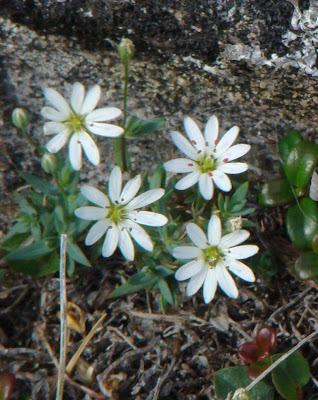 A case study of variability in Stellaria has been conducted with members of the Holarctic S. longipes complex (Macdonald et al. 1988). Four taxa are currently recognised within this group: Stellaria longipes ssp. longipes and S. longifolia both have circumpolar distributions in North America and Eurasia, but S. longipes ssp. arenicola and S. porsildii are each known from only small ranges in North America (Chinnappa 1992). Stellaria longifolia and S. porsildii are diploid species with a chromosome number of 26; S. longipes is a polyploid species, possibly derived from the hybridisation of the two diploids. Specimens attributed to Stellaria longipes show a huge variation in morphological characters: stem pubescence, growth habit, floral and fruit characteristics, etc. They also show a wide variation in chromosome numbers: individuals have been recorded with as few as 51 or as many as 107 chromosomes. You may be thinking that such variation must indicate that a number of species have been conflated under the name of 'S. longipes', and, indeed, a number of names have been based on variant forms of this complex. 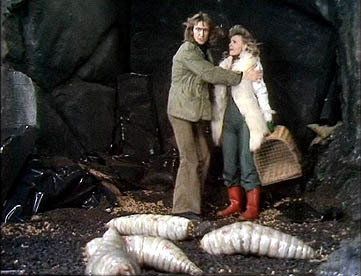 However, breeding tests conducted by Chinnapa & Morton (1984) failed to find any reproductive isolation between different morphs: all were fully interfertile. What is more, different morphs are not found in different ranges, supporting the cultivation results as a valid representation of what is happening in the wild. Despite their variability in morphology, the representatives of S. longipes form a single, rampantly outbreeding gene pool. Even the apparent question of chromosome variability becomes less significant when one considers that the majority of individuals have chromosome numbers of 52, 78 or 104: all multiples of 26. If you compare this to what we find in Rhogeessa, you can see that it is not chromosome number alone that is the controlling factor for interfertility. The important thing is the ability or otherwise of the chromosomes to form associations during meiosis allowing their appropriate segregation to form viable gametes. A slightly different form of Stellaria longipes, from here. The only segregate of Stellaria longipes that appears to be truly distinct is the form known as S. longipes ssp. arenicola. This is a restricted range form known only from an area of sand dunes south of Lake Athabasca at the northern end of the border between Alberta and Saskatchewan (true S. longipes ssp. longipes is also found in the same area). Distinction appears to have arisen between S. l. ssp. longipes and S. l. ssp. arenicola as a result of a change in fertilisation regime for the latter. Stellaria species (including S. longipes) are mostly protandrous: the male parts of the flower mature before the female parts are ready to receive pollen. This means that a flower generally cannot fertilise itself, and individuals are generally outcrossing. Stellaria longipes ssp. arenicola has reversed this pattern: protandry is reduced, and individuals are more likely to be fertilised by themselves than by others. The nature of their sand dune habitat also means that plants are more likely to germinate successfully alongside another individual than in an isolated position. This results in a clumped and patchy distribution of individuals that also promotes fertilisation within a limited pool of individuals, as fertilising insects forage within a single patch rather than travelling between patches. Genetic analysis indicates that a limited amount of gene flow probably does still occur between sympatric S. longipes ssp. arenicola and S. l. ssp. longipes (Purdy et al. 1994); nevertheless, this outcrossing is on the order of the occasional dalliance rather than the shameless harlotry of their conspecifics elsewhere. Bittrich, V. 1993. Caryophyllaceae. In: Kubitzki, K., J. G. Rohwer & V. Bittrich (eds) The Families and Genera of Flowering Plants vol. 2. Flowering Plants: Dicotyledons: Magnoliid, hamamelid and caryophyllid families pp. 206-236. Springer. Chinnappa, C. C. 1992. Stellaria porsildii, sp. nov., a new member of the S. longipes complex (Caryophyllaceae). Systematic Botany 17 (1): 29-32. Chinnappa, C. C., & J. K. Morton. 1984. 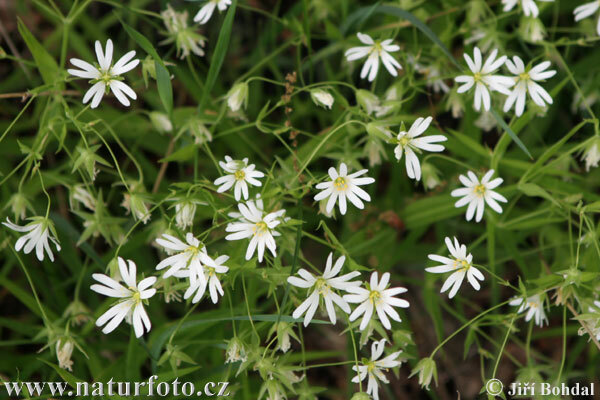 Studies on the Stellaria longipes complex (Caryophyllaceae)-biosystematics. Systematic Botany 9 (1): 60-73. Macdonald, S. E., C. C. Chinnappa & D. M. Reid. 1988. Evolution of phenotypic plasticity in the Stellaria longipes complex: comparisons among cytotypes and habitats. Evolution 42 (5): 1036-1046. Purdy, B. G., R. J. Bayer & S. E. Macdonald. 1994. Genetic variation, breeding system evolution, and conservation of the narrow sand dune endemic Stellaria arenicola and the widespread S. longipes (Caryophyllaceae). American Journal of Botany 81 (7): 904-911. Wu Z.-Y. 1991. Some problems on the taxonomy of Chinese Stellaria. Acta Botanica Yunnanica 13 (4): 351-368. In spite of interploidal gene flow and the occurrence of numbers from 51 to 104, the four ploidy levels (2x,4x,6x,8x) remain as the hegemonic cytotypes in natural populations. It seems that selective pressures are acting to keep whole multiples of the original diploid set of chromosomes. Could be that most of "aneuploid" individuals would be evolutionary end lines. Yes, that was what I was thinking. Though selection doesn't appear to be slowing gene flow between ploidy levels; probably because some combinations of ploidy levels are still stable (4x × 8x giving rise to 6x, for instance). One thing not mentioned in the post that might also be relevant is that individuals can also multiply vegetatively through rhizomes. So an aneuploid individual with reduced (but not zero) fertility might still persist long enough to produce seed. And depending on what other individual the fertilising pollen came from, some of that seed might itself have a stable ploidy.